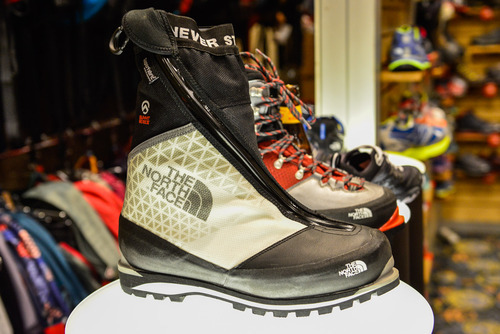 In winter season 2013/14 I had the opportunity to test The North Face Verto Glacier GTX S6K. Verto S6K model was released in the winter season 2012/2013 and you can tell that it is "older brother" Verto S4K GTX model, dedicated to a height of 6000 meters above sea level row (S4K was at about 4000 meters). TNF company produces shoes in this category just only a few years so I was curious to see how Verto S6K prove themselves. Under this link you will find a description of the manufacturer. Ultimately, I was going to wear shoes in the spring in the Alps. Life and the weather, however, verified the plans. Finally ended up at several climbing days in Tatras. Many of this climbs had an alpine character - large (as in terms of the Tatra) wall, under which you have to approach a few hours:-). In any case, I can say that it was a real test, not a description of the "first impressions/outdoor review". Immediately throws himself into the eyes of an aesthetic and interesting look, referring to the model S4K. Definitely shoes blend well with the other elements of clothing. The positive aspect is the weight of shoes, oscillating around 1800 grams for the pair (size 42). My weighed 950 grams one (size 44). Interestingly between the left and right shoe was ~ 20 grams difference. 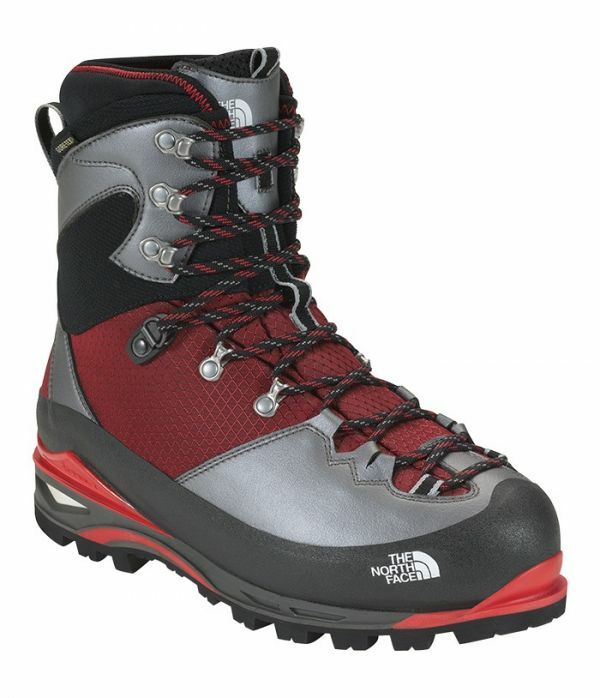 The shoes are light, yet rigid sole is sufficient for automatic crampons. Speaking of sole, it is made of Wibram and has a deep tread. Both on dry and wet rock is well:-). A definite plus is the "climbing zone" on the back of the front of the shoe. So we have more confidence when climbing in rocky terrain, without crampons. Shoes, of course, allow plugging automatic crampons. I have used them automatic BD Cyborg crampons. Front of the shoe is slightly raised, making the crampons frotn point were slightly raised. However, this did not affect in any way the comfort of climbing in the ice and mixt. Over sole shoes are surrounded by a plastic rim that prevents mechanical damage. Front of the shoe itself is reinforced synthetic leather. The interior lining of the shoe is comfortable, with a Gore-Tex material, providing waterproofing and breathability. At the top of the shoe's is collar to protect from snow. It is worth noting that the solution (as well as others), it will be a weak check in deep, loose snow on the approaches and descents. However, gaiters are sometimes better:-). Lacing system allows tight lacing shoes feet. Below Verto shoe manufacturing process. Just film a model S4K, but the production process S6K should not vary much. Absolute priority in terms of shoes - any kind. I'm the owner of a relatively narrow feet and shoes which I used earlier, were the products Scarpa and La Sportiva. I was afraid that S6K because of American origin, will be dedicated for wider feet. My doubts dispelled the first fitting in the store. Shoes in my size were well matched and did not have the elements that cause discomfort. Of course, the first trip was to prove crucial. Fortunately, the shoes do not cause any irritation and the walking was comfortable. After hundreds of kilometers have not changed my opinion;). It is worth noting that these were kilometers with a backpack full of gear, which is typically ~ 5-10 kg. During the XI Memorial Bartek Olszanski, I found myself on skis go over to the Slaski Dom in Wielicka Valley. I decided to put into practice (somewhat forgotten) patent shoes attaches to ski bindings Silveretta 404. After two hours, but the approaches were sore heel. It is no wonder, however, the movement of the foot in ski-tour is completely different and heel works in a way that the designers did not anticipate. Last but not least – ride on skis after it was interesting:-). This is what Tiggers like best. Ice, Tatra pot, mountaineering is definitely elements Verto S6K. In ice they are really well. Are relatively soft, so we can freely operate feet, on the other hand lacing system holds the foot firmly. They are not dedicated to hard drytooling;), although I do in them M8. But in the Tatras rock and frozen grass have quite an impressive mileage. As in ice. 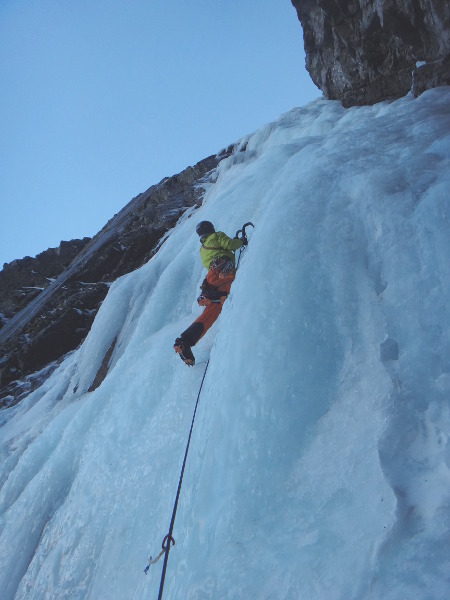 Saying, "How is winter, it must be cold," does not refer to climbing in the Verto S6K. Little they have risen and climbed under different conditions. 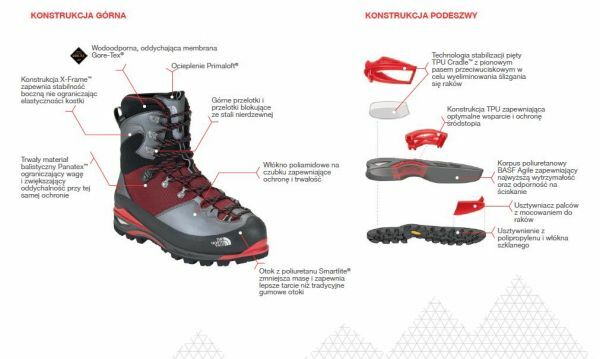 After a few excursions into the Tatra Mountains noticed that the silver coating on the front of the shoe has a tendency to scratch when crampons teeth hit them. This does not affect the strength of the shoe, only aesthetic issues. Manufacturer did not notice the shortcomings in the testing phase? Verto S6K a great debut in the segment of TNF's shoes high-altitude mountaineering. Very comfortable during long marches and climbing. Warm to the ranks. Climbers who preffers style light & fast should be happy with this choice. I feel like I still have a lot of miles in them will go:-). Oryginal text was in polish (on drytooling.com.pl). More photos on gallery (drytooling.com.pl).